Pan-Seared Strip Steak with Balsamic Onion Sauce. Day # 1 without a refrigerator. I produced a pretty terrific dinner today, and I also made chicken broth for a future soup. My dinner consisted of Strip Steaks with Balsamic-Glazed onions, Baked Butternut Squash with Garlic and Herbs, and Hasselback Potatoes. 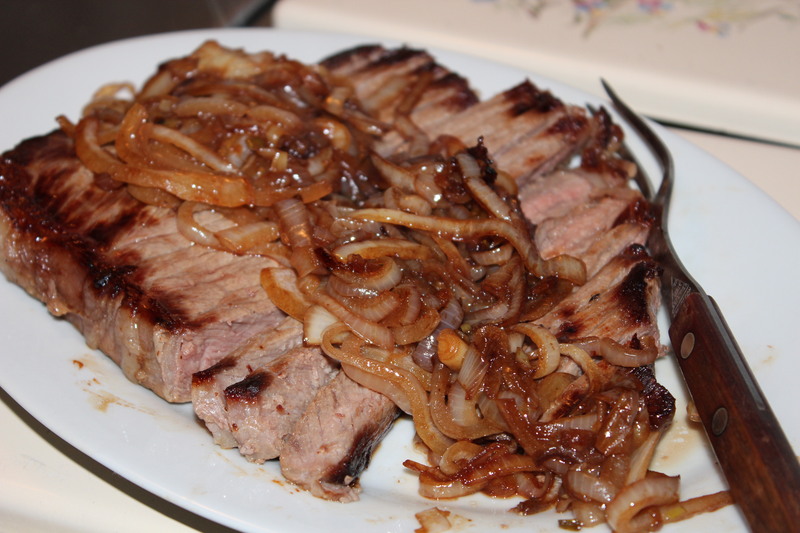 For today’s recipe I will be telling you how to pan-sear a steak, and a quick way to make caramelized onions. 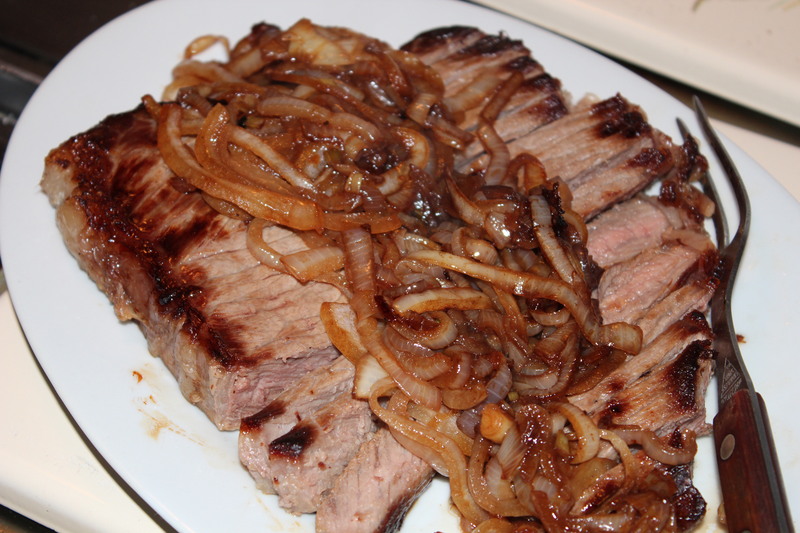 Whenever we go to our favorite steak-house, I like to order a strip steak with a pile of caramelized onions. I almost like the onions better than the steak. They are so rich and glossy, they turn a simple seared steak into something really special. I had purchased a package of two strip steaks with the thought of trying to recreate this simple dish at home. Faced with the fact they had started to defrost, I realized the time to give this meal a try was now. Onions browning in a little oil. and then added balsamic vinegar to the pan. 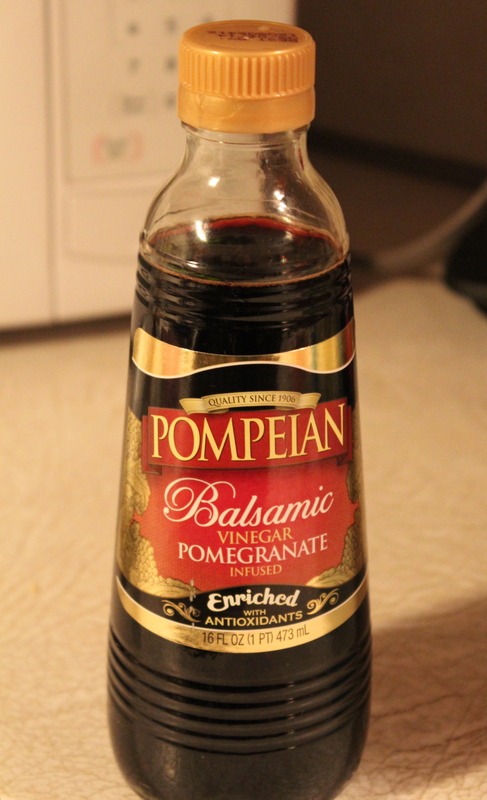 A nice variety of balsamic, with a hint of pomegranate added. Two minutes later the onions were soft and fully browned. How could that be, you ask? Well, the sugar in the vinegar speeds up the browning process, and the steam generated by the simmering vinegar softens the onions in a flash. Finally, the vinegar turns the onions brown. My balsamic onion sauce may not taste exactly like caramelized onions, but it came pretty darn close. 1. Heat 2 Tbspns oil in large skillet over medium heat. Add onions and salt and cook, stirring frequently, until lightly browned, about 8 – 10 minutes. Transfer onions to a bowl. 2. Add remaining oil to skillet and heat over medium-high heat until shimmering. For a nicely browned and flavorful crust, pat the steaks dry with paper towels, and season with salt and pepper. 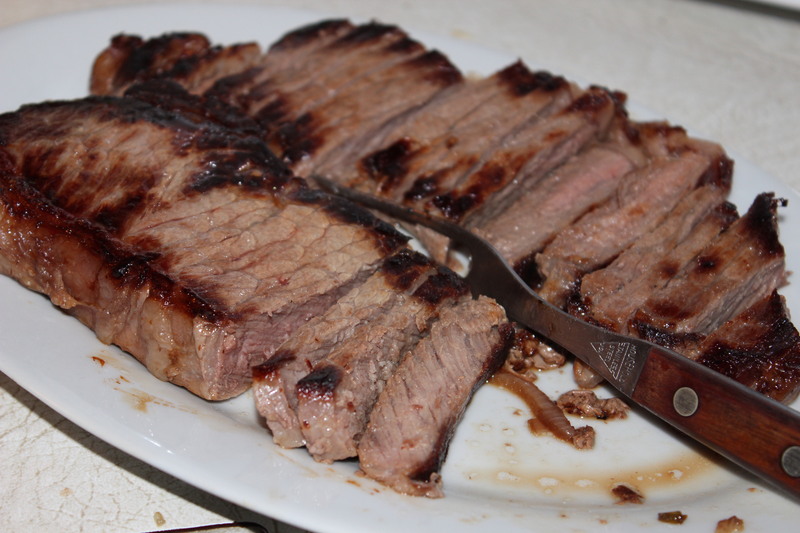 Cook steaks, without moving, until browned on first side, 4 – 5 minutes. Flip steaks and continue to cook until browned on second side, 3 – 4 minutes more. Transfer steaks to a platter and cover with foil. 3. 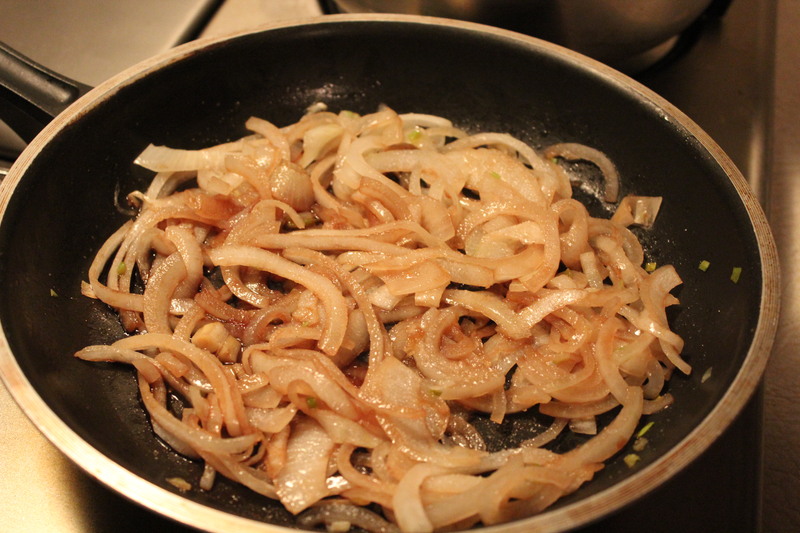 Discard fat in skillet, return onions to pan, and set over medium heat. Add garlic and cook until fragrant, about 30 seconds. Add 1/4 cup vinegar, rosemary, and cook, scraping up browned bits, until thick and syrupy, about 2 minutes. Pour any accumulated steak juices into pan and mix in. Season with salt and pepper. 4. Slice steaks crosswise into 1/4 -inch slices and transfer to serving platter. Slice steaks crosswise into 1/4-inch slices. Spoon onions and sauce over steak. Steak with Onions and Sauce. Well, Thank you! I thought I did good! HaHa.